SADE's "Soldier of Love" CD which dropped after a 10 yr hiatus from this iconic songbird. 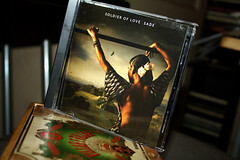 The CD is 10 Solid Tracks strong, with the current self titled single "Soldier of Love" getting regular radio airplay . She has several TV appearances in the upcoming week, and the best advice would be to follow the her official website link below to keep up with her activities. How exciting, the thought of her touring in the near future to promote her new CD. Hope she comes to a city near you!